Researchers at the Max-Planck-Institute for Astrophysics have developed new relativistic models which allow predictions of so far unknown properties of short gamma-ray bursts. Their simulations will come under scrutiny by the Swift Gamma-Ray Burst Explorer, a NASA mission that is scheduled for launch in the fall of 2004. Fig. 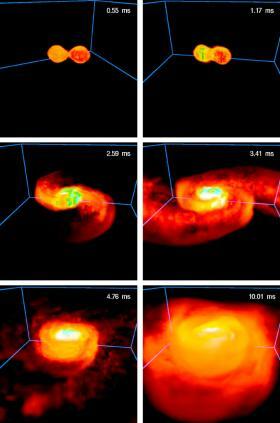 1: Snapshots of the merging of a binary neutron star (from top left to bottom right). The stars heat up when they plunge into each other and form a cloud of hot matter that surrounds a very dense, massive inner core. 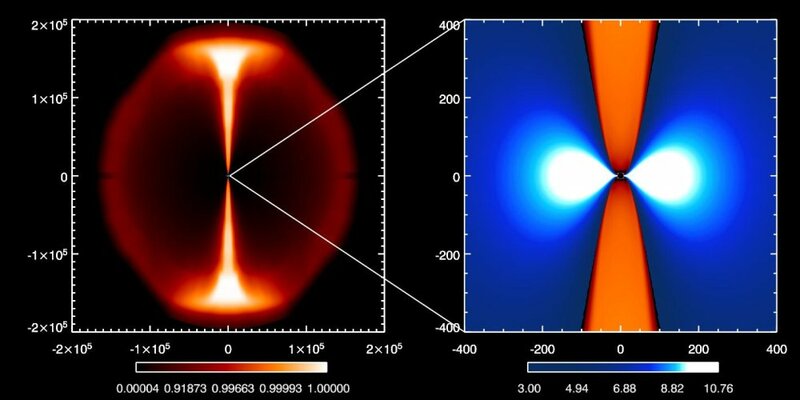 This core is likely to collapse to a black hole. The displayed evolution occurs in just a hundredth of a second (picture: Ruffert and Janka 2001). Abb. 4: The energy of the jet flow with velocities larger than 99.995 per cent of the speed of light as measured by a distant observer from different viewing angles relative to the jet axis. It is assumed that the observer does not know that the jet is narrowly collimated to opening angles between 5 and 10 degrees and therefore interprets the explosion as isotropic. The displayed lines correspond to a sample of computed models. Gamma-ray bursts are among the most energetic and most luminous explosions in the Universe. They occur roughly once a day, last from a few thousandths of a second to a few hundred seconds, and come from all different directions of the sky. Their gamma radiation is more energetic than visible light and can be measured by satellites orbiting the Earth in space. The energy set free by the bursts in just one second is comparable to the energy production of the Sun during its whole life. The more than 2700 observed bursts are grouped into two distinct classes, one of which are the so-called long bursts that emit gamma radiation for more than two seconds, and the other one are the short bursts with durations up to two seconds. So far only long bursts could be observed in much detail. The detection of associated afterglows in X-rays, visible light and at radio wavelengths allowed the determination of their distances and confirmed their origin from host galaxies at large redshifts, i.e., typically hundreds of millions to billions of light years away. Until recently the source of these bursts was a mystery. But evidence has accumulated that they are death throes that accompany the catastrophic explosions which end the lives of very massive stars. A final confirmation of this conjecture was provided by GRB030329, a gamma-ray burst which was detected on March 29, 2003, by HETE, NASA's High-Energy Transient Explorer satellite. For the first time this burst could unambiguously be identified as linked to a peculiar supernova named SN 2003dh at a distance of about two billion light years. But where does the gigantic energy come from which powers the gamma-ray burst? Scientists have coined the theory that the "engine" is a rapidly spinning black hole which forms when the central core of a dying star becomes unstable and collapses under its own gravity. This newly formed black hole then swallows much of the infalling stellar matter and thereby releases enormous amounts of energy in two "jets". These expand "highly relativistically", i.e. with almost the speed of light, along the rotation axis of the star. Before they break out from the stellar surface, they have to drill their way through thick layers of stellar material, thus getting collimated into very narrow beams with an opening angle of only a few degrees (see Current Research -- March 2000). Indeed, observations not only confirm the origin of long gamma-ray bursts from exploding massive stars, but also provide evidence that the gamma emission comes from narrowly collimated, ultrarelativistic jets with velocities of more than 99.995 per cent of the speed of light. Fig. 3: Gas outflow from the accretion torus more than half a second after the onset of the energy release at the black hole. The axial jets (bright white regions) with velocities above 99.995 per cent of the speed of light have reached a distance of more than 150000 kilometers. These ultrarelativistic outflows cause gamma-ray bursts at much larger distances. The gas ejected off axis is much less energetic and slower; it has a velocity of typically less than 98 per cent of the speed of light (red regions). The right panel shows a zoom of the close vicinity of the central black hole (out to a radius of about 400 km) with the base of the jets and the extended accretion torus. Whitish regions indicate gas densities above about 1000 tons per cubic centimeter. MOVIES: These movies show the evolution of the ultrarelativistic jets and of the accretion torus. In case A energy is released at the black hole only for a tenth of a second and in case B the energy release is continuous, but decreasing steeply with time. The movies are in AVI/Xvid format and be viewed using e.g. mplayer. Rotating, growing stellar mass black holes are also born in other cosmic events, for example in the violent mergers encountered by binary neutron stars (Fig. 1) or a neutron star and a black hole (Fig. 1) after hundreds of millions of years of inspiral, driven by the emission of gravitational waves. The remnant of such a catastrophy is a stellar-mass black hole sucking matter from a girding, thick torus of gas (Fig. 2). Such events have long been considered as possible sources of gamma-ray bursts, and they are still hot candidates for bursts of the short type, which so far could not be studied by observations in the same way as bursts from dying stars. Researchers at the Max-Planck-Institute for Astrophysics have now developed better computer models that take into account effects due to Einstein's theory of relativity. Their simulations can follow the highly relativistic ejection of matter that is caused by energy release (e.g., due to particle reactions) in the close vicinity of the black hole. The calculations confirm that short bursts have properties that are distinctively different from those of long bursts. 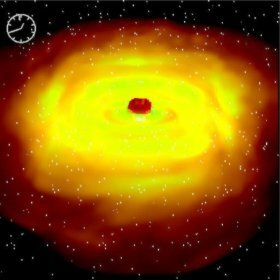 Since the black hole--torus system is not buried inside of many solar masses of stellar material as in case of dying stars, the polar jets do not have to make their ways through dense stellar layers and quickly reach extremely high velocities (Fig. 3). As a consequence, they are strongly collimated by the presence of the accretion torus, but their opening angles are somewhat larger than those measured for long bursts, typically around 5 to 10 degrees (Fig. 3). The models predict that outside of these polar cones gamma emission should become very weak (Fig. 4) so that a gamma-ray burst will be observable only from one out of hundred mergers when the ultrarelativistic jet is sent towards Earth. The models also suggest that short bursts can be nearly as bright as long bursts, although their total energy release is 100 times lower. Previous gamma-ray satellites were unable to make precise measurements for short bursts, but there is hope that these predictions can be tested soon. The Swift Gamma-Ray Burst Explorer, a NASA mission with international participation, is scheduled for launch in the fall of 2004. One of its prime goals is to unravel the mysteries of the short bursts. M.A. Aloy, H.-Th. Janka und E. Müller (2004), Astron. Astrophys., submitted (astro-ph/0408291).